It is controvercial because it undermines one basic principle that the law mustn`t be retroactive. Poland will save millions from new rules that cut state benefits for former communist security service officers, the country’s interior minister has said. Thousands of former officers of the country’s feared communist-era security services will have their pensions cut under the new rules, which took effect on Sunday. According to Interior Minister Mariusz Błaszczak, the move will affect around 39,000 and save Poland about PLN 500 million (USD 137 million, EUR 116 million) a year. Under the law, the maximum pensions and disability benefits for former security service employees will be no higher than average state payouts. “This is what justice is all about,” Błaszczak said on state television on Saturday. When the government debated plans to cut payouts at the end of last year, Prime Minister Beata Szydło told reporters: "Today we are restoring social justice." As it should be. They should be grateful for any pension given to them at all. Yes, but the new law treats them the same while each man`s story is different. First case - secret service agents who got Americans from Iraq in 1990 will have their pensions lowered. They had joined the services in communist times. It doesn`t matter that they positively passed the verification by democratic institutions and continued their work for new Poland. Operation Simoom (Polish: Operacja Samum) was a top secret Polish intelligence operation conducted in Iraq in 1990. In 1990 the CIA asked European intelligence agencies to assist in the withdrawal of six American operatives (a mix of CIA and DIA officers) investigating Iraqi troops movements in Iraq before the Gulf War. Several countries, such as the Soviet Union, Great Britain, and France refused to help in such a dangerous operation; only Poland agreed to help. Poland had connections in Iraq due to Polish engineering firms' construction work throughout the country and sent a few operatives to start working on the operation. Gromosław Czempiński became the commander of this operation, assigned to it by Polish Minister of Internal Affairs and first chief of Urząd Ochrony Państwa, Krzysztof Kozłowski. Ironically, Czempiński has previously been a spy in the United States and either took part or led many operations against the Western intelligence services. The main plan was to reestablish contact with the hiding American spies and give them Polish passports so they could escape from Iraq in a bus, alongside Polish and Russian workers. The six agents were hiding in Kuwait and Baghdad for several weeks before the escape was carried out. The operation was very difficult because the Iraqis started to suspect some kind of American-Polish intrigue. The agents were given refuge at a Polish construction camp, and then provided with passports and put on a refugee bus. An Iraqi officer at checkpoint on the border had studied in Poland and spoke Polish well enough to communicate. When the bus arrived at the border, he asked one of the American spies a question in Polish. Since the spy did not know Polish at all, he pretended to be heavily drunk (another version states that the operative in question fainted). Nevertheless, the bus managed to cross the border with all occupants (WP 1995). Poles moved the agents out of Iraq and into the safety of Turkey. Operatives from both sides returned to their countries. Polish forces rescued not only the agents but also secret maps—detailed maps of various military installations and of crucial points in the capital of Baghdad itself—apparently crucial for Operation Desert Storm. As a reward for Poland's help, the US government promised to cancel half, or $16.5 billion, of Poland's foreign debt. In at least two other operations, the Poles later aided another 15 foreigners to escape, mostly Britons, held hostage by the Iraqis as part of Saddam Hussein's "human shield" campaign to deter an allied invasion. Information about this operation was first revealed in 1995 by The Washington Post. In 1999, Polish director Władysław Pasikowski made a movie, Operacja Samum about this operation; it was the first Polish production co-financed by Warner Bros. and third by HBO. They were highly compensated for their loyalty to a regime that no longer exists. As for the few exceptions you mentioned, I am indifferent. I have very little respect for intelligence spooks (American or otherwise) who prepare the way for arguably unnecessary wars. I actually know some Intel operatives and I can assure you they lived a life of great privilege and immunity. I see. Well, I am fairly neutral about the law because it doesn`t concern me or my family. However, putting all guys into one basket seems unfair because I believe each case should be dealt with seperately. Another example: soccer players who won medals for Poland in 1970s` national team will also lose money. In those times, major sports clubs were owned by the communist army or police and players were officially employed by those forces. This is enough to treat them as the regime collaborators today. A former AK and Warsaw Rising soldier, prisoner of POW camp, after the war worked as a physician in the Interior Ministry hospital. Each major city had such a hospital which provided medical care to communist police, their families but other people, too. E.g., I was born in such a hospital. For each year the pension is reduced by 10%. This above mentioned physician worked 10 years in the hospital. And one important info to sum it up: the pensions of deceased workers received by their families will be reduced or stopped, too. As you can see, it is not as simple as you originally thought. At best, you misrepresented the facts in your original statement. "Poland will save millions from new rules that cut state benefits for former communist security service officers"
Since when are Doctors and Athletes security officers? "Under the law, the maximum pensions and disability benefits for former security service employees will be no higher than average state payouts." What part of this do you consider unfair? I wish them no harm but you cannot reward former "officers serving a criminal system" with a greater pension than that of an average citizen. Honestly, they should be grateful to still be alive. Misrepresented. Not my statement, but the Minister`s. Athletes - security officers? It is enough they were officially employed by police or army and received regular salaries. At that time there were no professional sportsmen - the system rejected such an option. They had to have contracts as policemen, soldiers, miners, ship builders. I suppose it can be quite complicated for a person who spent all their life in a democratic country, but communist countries had their own special style. However, today there is complete info chaos and we`ll have to wait to see who really lost benefits because the Minister with gov officials say one thing and the media another. If one of the most famous Polish footballers lived today, he would also be elligible for reduction. Deyna began playing youth football in 1958 at his local club Włókniarz Starogard Gdański. In 1966 he made one appearance for ŁKS Łódź (on 8 October in a 0–0 draw against Górnik Zabrze). But he was quickly snapped up by Legia Warsaw. 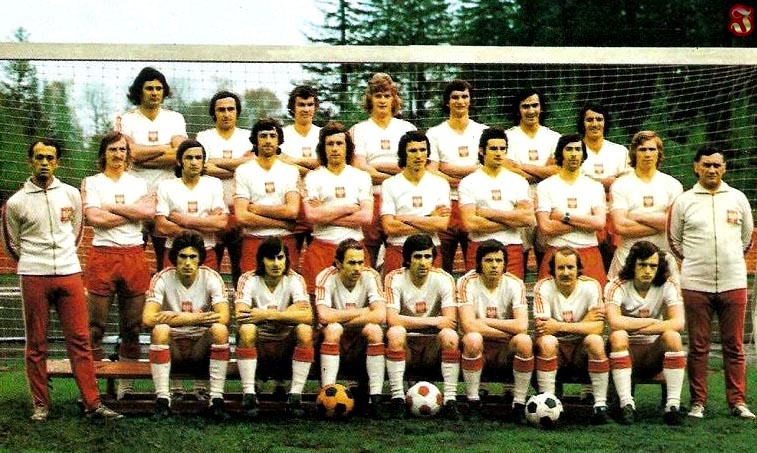 In communist Poland each team had its own "sponsor". The Warsaw club was much more powerful as it was the military club. Moreover, it was the favourite club of the authorities. Deyna was called up into the army and in this way he had to play for Legia Warsaw. He made a name for himself during his first season, becoming one of Legia's most important players. Unfair. What you read as no higher, often means much, much lower, on the verge of subsistence. Criminal system. Well, I received my education in this system but I am not a criminal. That must be that strong will of mine, I suppose. Grateful to be alive. Please. Poland is not Romania where guys were shot without trial. Besides, I already wrote it, over half of those core security servicemen were verified positively by democratic institutions after the system collapsed and they were allowed to work in free Poland. Not all of them had been the oppressors of the Church and anti-communist opposition as you seem to believe. E.g., some of them worked in industry departments and investigated serious frauds and embezzlement which take place in every economy, and regardless of the political system, are always considered crime. Some of them collaborated with the opposition and warned activists about moles in Solidarity or planned arrests. I believe the state cannot treat those people the same because there is a big difference between a lady who worked in a passport and id card office (she just distributed papers to citizens) and an agent who persecuted priests and opposition activists. Both worked for the same institution - SB - Security Service - and if still alive, both are subjects of the new legislation. As you can see, it is still not as simple as you originally thought. Nothing is only black or white. If you misunderstood things because I hadn`t elaborated on details, then I am sorry, but I sometimes lack time to do it. The Polish state has just lost the case started by a former secret police member who cooperated with Solidarity and the Church in 1980s. His former pension must be restored and they have to pay him everything what was deducted after the anticommi law had been introduced.